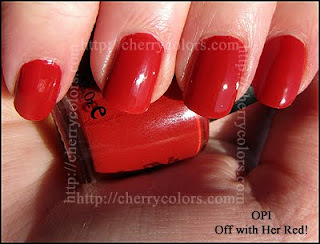 NOTD: OPI Off with Her Red! - Cherry Colors - Cosmetics Heaven! 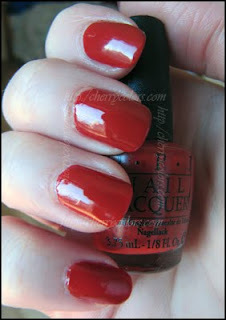 NOTD: OPI Off with Her Red! I decided to change nail polish (the China Glaze resisted a looong time, but it stained my ring finger nails), and since I got new ones today it had to be one of those. 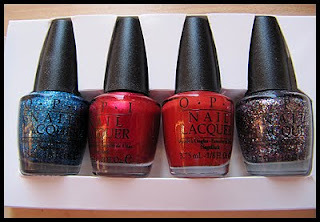 Honestly I wanted to get this mini set just because of the Mad Hatter and Absolutely Alice, but I liked the brick red so much, that it is the first one from that collection on my nails! It says it is "A glowing, empowering hot red." But honestly, more than a true red it is an orange red.. 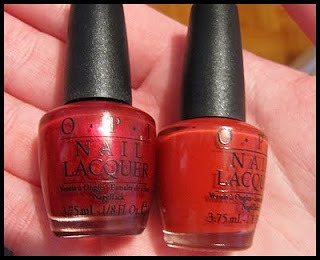 Comparison between Off with Her Red! and Thanks so Muchness (same collection). I never had an orange red, but I feel it suits my skin tone really well. Now I want a full bottle of this beauty! Ahh, aren't they super cute? You know what is the best thing ever about them? They dry really fast, and are a dream to apply!